Slovakia is right in the heart of Europe, and its colourful history is intertwined with that of its neighbours - especially the Czech Republic. And while many folk have been to the Czech Republic, not as many venture into Slovakia - even though it got the lion's share of beautiful, ancient castles and wild wildernesses when it came to breaking up Czechoslovakia. Since the split in 1993 Slovakia swiftly became one of the youngest members of the EU, and welcomed in a number of low-cost airlines. And some of the best places to stay in Slovakia offer some of the best value in Europe. and a vibrant folk culture which varies wonderfully from village to village. Bratislava, the capital is also known for being small, and kind of quirky, with its Gothic, Baroque and Renaissance architecture, numerous museums and very high ratio of cafes per resident. It's also known for being a great place to let your hair down. EU membership has pushed up the prices a bit, especially in Bratislava, but this is still an excellent European destination if you're looking for somewhere good value and a bit off the beaten track still. Marrol’s has wonderful retro style and spirit, with lots of treasures kept on from the 20s and 30s. Once a stylish townhouse, now a stylish hotel this whole property proclaims 'old fashioned luxury' to guests - who'll be greeted by name by white-gloved bellmen. 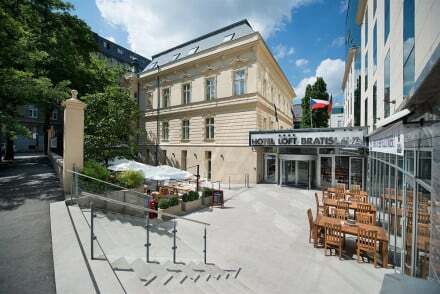 The Art Hotel William is a smart, modern hotel in a great spot in Bratislava's Old Town. There's a strong colour scheme in the spacious rooms, making this feel like a sophisticated place to stay. The Hotel Arcadia in Bratislava's Old Town offers five star decor and service, including award winning traditional Slovak cuisine, an extensive spa menu and classically elegant interiors - and all in a charming 13th Century building. The Hotel Albrecht is thought of as one of Bratislava's best, with a reputation for magnificence - but state-of-the-art, of course. It's also got a great spa and an excellent restaurant, and the outside of the hotel will really impress you. Antares in Bratislava is a four star, budget priced hotel in an upscale residential location - so you get peace, privacy and city views with state of the art equipment and a lovely garden and terrace starting from £42 per night. The Hotel Arcus is a small, family run B&B, also conveniently positioned for Bratislava's main sights, with big rooms and a sunny garden and terrace. Penzion Virgo is a Baroque style pension house within walking distance from Bratislava's charming Old Town. As well as generously proportioned rooms and suites, the Penzion Virgo also has several guest apartments with their own catering facilities. Rooms start from £62 per night. Well located for the major sights, the Skaritz Hotel and Residence has a mix of 20 rooms, suites and apartments, and an understated elegance. So its great for discerning families and groups. Room rates start from £64 per night. The Kempinski Hotel River Park Bratislava has a luxurious spa and many of its rooms and public spaces offer beautiful views of the Danube. The whole vibe is bright and airy, with upmarket service and a great restaurant. Still not sure which is the best place to stay in Slovakia for you? A stylish, urbane hotel in the centre of Slovakia's capital. With sleek, contemporary rooms and a lively bar and beerhouse, it's a place that reflects the vibrancy and up-and-coming feel of Bratislava. With cheap rooms available, it's a superb value for money option. Local exploring - Perfect for exploring the city, just a stones throw away from the Presidential Palace and the Old Town area. Value chic - Well priced loft-style rooms in a central location, views over the Presidential Palace and chic wine bar. Sights nearby - Slovakia's Presidential Palace is with five minutes walk and the Bratislava Castle is fifteen. Local markets - Explore the local Slovakian markets in Bratislava city centre. Boutique style pension house within walking distance of the Old Town and Grassalkovich Palace. Its range of contemporary accommodation - from spacious guest rooms to apartments with kitchenettes - make it an ideal spot for groups or families. Families - The large self catering apartments make this an ideal spot for families exploring Bratislava. Great walks - The hotel provides free city maps and guides, head out and explore the beautiful Old Town. Sights nearby - This central hotel is just 200m from the historic Presidential Palace.